While most of us won't see our lives fall apart if true Push is not happening on MobileMe, it's still disappointing that Apple implied they were solving a complicated and thorny problem vs. simply speeding up the frequency of syncing via an existing method. FWIW, this weekend I informally tested MobileMe's syncing skillz on two Macs, "the old iPhone," and via apps on the MobileMe site. Mostly this consisted of creating calendar items with unique date and time stamps and seeing how long it took for them to show up on the different devices. Let's just say the two Macs were, far and away, the pokiest syncers for both incoming and outgoing events. Mostly I guess I'm just bummed that this wasn't the sufficiently advanced technology that it seemed. I'm sure there's room for improvements and enhancements to MobileMe -- and God know what it took to get that thing out the door in the midst of last week's shitstorm -- but I'm disappointed in Apple. I don't mind the RDF -- a lot of times, it's a fun place to hang out for an hour or two -- but playing fast and loose with terms that mean something in the market they're trying to penetrate is not cricket. 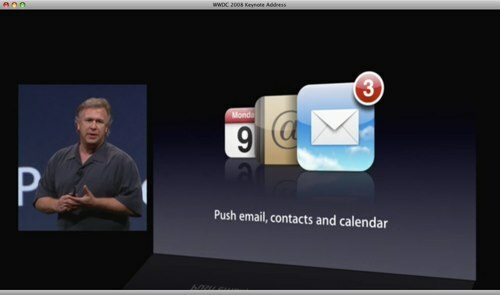 holgr.com » Blog Archive » Apple’s MobileMe - Push or in sync? Looks like Apple has removed all mentions about push mail from their MobileMe site. It has been removed from the MobileMe Mail features list too. Now your mail is “in sync”. But they forgot the mentioning at their enterprise site, where they are talking about Exchange push mail. That, to me, doesn't sound like "push," it sounds like "sync." The term "push" still applies, however, to me.com email, as that shows up immediately (in my experience, at least.) Calendars and contacts, though, not so much, apparently. Was Apple playing lawyerball with the term “Push?” Is this just a marketing disappointment, or are you missing functionality that you were counting on? Is a 15-minute syncing adequate for your needs? And what had you taken away from the MobileMe demo at WWDC? Was Mr. Schiller’s explanation accurate of the service you received? Jump to starting around 1:07:00 of the WWDC Keynote to decide for yourself. Classy, well put, and mostly well-explained. Plus, as Dan Moren mentions in comments, they're tossing in a free month of service, owing to a .Mac -> MobileMe transition that was "rockier than we had hoped." Thing is, it still doesn't help me understand how some of the most competent engineers (or is it marketers?) in California knowingly chose to call this functionality something that it clearly was not. That still bugs me.